Get in here people! 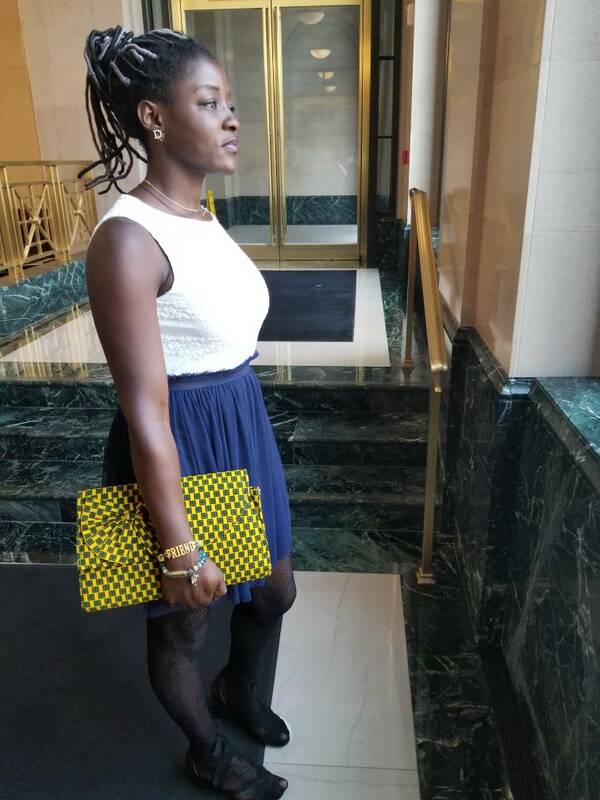 Jingwa Grace is a Cameroonian changemaker and you’ve probably never read an interview as spicy as this. Jingwa Kakdeu Lesly Grace’s accomplishments and ambition at such a tender age would make you realize that age is only in digits. From being a Tony Elumelu Entrepreneur to a YALI Alumni to a SUSI Alumni and an International exchange Alumni, amongst being the founder of a Mosquito Repellent Product. Hey Grace, can we get to meet you? I am JINGWA KAKDEU LESLY GRACE. I am 20 years old, single with no children. I come from the South West Region of the Republic of Cameroon specifically Bangwa Clan. I’m currently a Junior at the Catholic University Institute of Buea, studying accountancy. I’m a holder of GCE Advanced and Ordinary level certificates with 5 and 8 papers respectively. Being the seventh child out of eight from a polygamous home gave me lots of motivation, leadership and entrepreneurial skills due to the fact that my dad always let me check and handle issues concerning our family business, especially our accounts since my elder brothers and sisters are now independent making me a potential successor. Also, it led to my active participation in the President Obama’s Young African Leadership Initiative, my competitive selection as a Tony Elumelu Entrepreneur for 2017 and a SUSI Leader. Part of my entrepreneurship skill was developed as a result of my active involvement in an association of dynamic young Leaders and Entrepreneurs known as JUNIOR CHAMBERS INTERNATIONAL (JCI) where I served as the financial secretary of my local Chapter at the Catholic University Institute of Buea. These experiences coupled with local challenges indicate that women in entrepreneurship (Leading Women) are very necessary and urgent for Cameroon’s emergence by 2035, reason why I’m currently highly motivated. You love leadership and Cameroon soo much! Now, please tell us about how much you love Africa and want to see Africa grow too. I believe in my continent, it has what it takes to become what you want it to be. If I were to be born again and asked to choose where I wanted to be, I will definitely choose my ‘AFRICA’ without second thoughts. For real, nothing is sweeter than home so I will always decide to be home no matter the situation, except if it becomes too much to bear. But for real, there are a lot of opportunities found in this place which cannot be compared to any other place. It is filled with love and cultural diversity which makes everyone united but unique in one way or the other. That is what I love about Africa. Its collectivity and concern for one another (one man’s problem is everyone’s own and the problem will always end up being solved). Ooooooh my AFRICA you are a place to be which is full of beautiful sites and nature. To be specific I am mainly from CAMEROON which is commonly known as AFRICA’S MINIATURE. Without any conflict, I will privately host you and give you a tour of the best, the good, the bad and the ugly places for you to see what I am talking about. Get to me at +237651101070. You’re a Tony Elumelu Entrepreneur, YALI alumni, SUSI alumni and an International Exchange Alumni. What motivated you to go in for all these things? Part of my entrepreneurship skill was developed as a result of my active involvement in an association of dynamic young Leaders and Entrepreneurs known as JUNIOR CHAMBERS INTERNATIONAL (JCI) where I served as the financial secretary in my local Chapter at the Catholic University Institute of Buea. entrepreneurship and leadership. When I look around and see the number of people counting on me because I know I am not doing all this for myself but of course for my community and the people who believe in me and need my help. I cannot take all the credit for my achievements, because if not for a special person that also came into my life and turned it around then I don’t know what would have happened. However, thank you Mr. ANYE CHO BOVINILLE for your coaching, mentoring, caring and most especially your love towards me. As I will always say it is not about the number of programs you are selected for or your words of mouth but for me it is about putting everything into practice and impacting lives positively all around you and even further. You are so deep into entrepreneurship. To you, why is entrepreneurship important? It is not only entrepreneurship that is important but the determination of being not only an entrepreneur but a social entrepreneur who sees in problems, a very big solution from which he or she can save lives and at the same time earn a living, not forgetting the most important thing, which is creating jobs for most youths because that is the greatest challenge in most of our societies. So, definitely, entrepreneurship is the most important process of changing lives which makes us job creators rather than being job seekers. The first is Nature’s candy. It has a great impact on sustainable development; in fact, we fight against high blood pressure, stroke, and heart disease, type 2 diabetes, obesity and digestion problem which are responsible for 43% of total annual death cases in Cameroon. We provide a simple and natural therapeutic method of prevention that is adapted for more than 80% of the population of the country and the sub-region of central Africa. Our vision is to launch the operation “ZERO obesity, heart disease, unhealthy blood, diabetes and digestion problem” to implement in the minds of Cameroonians a Nature’s Candy fruit salad with fruits harvested only when fully mature, cut when naturally ripe, and delivered fresh from harvest in as little as 48 hours safe for human life and no side and environmental effect. We will evaluate our success by our business progression as we conquer 1/3 of the healthcare market in the first six months, then double this number by recruiting 100 youths and women after 1 year of operation and will increase this number gradually according to our benefits. This is to fight against unemployment which is one of the most important objectives of the Sustainable Development Goals (SDGs). My second business is the Natural Mosquito Repellent Cream (NMRC). It is a Citronella oil, petroleum jelly based cream that provides 6 hours long-lasting protection against female Anopheles mosquito bites which is used as a therapeutic method for malaria prevention. This project came about as a sad tragedy I experienced in high school by losing my aunty because of chronic malaria. This motivated me to team up with chemical engineering students of which we started researching and realized that malaria in Cameroon is responsible for 30–35% of the total annual death cases (Oyekale, 2015) and records from the Cameroonian Ministry of Health estimates that about 8.2 million people suffer from malaria attacks each year (Ndo et al.,2011). Most Cameroonians spend huge amounts on anti-malarial drugs, nets and insecticides mean while a therapeutic method of prevention has been neglected even though it is cheap (500 XAF) and readily available for less privilege people in our community (farmers). As I will always say it is not about the number of programs you are selected for or your words of mouth but for me it is about putting everything into practice and impacting lives positively all around you and even further. How did you overcome the challenges you faced when starting your business? First of all what were my challenges? Securing finances from banks and micro finance banks is our major challenges as we don’t have enough assets to mortgage. Limited mentorship and coaching from business incubators, we don’t have in our region. Unavailability of machinery to support fruit process into salad and into the package leading to time consumption. Overcoming the above challenges was and is not still an easy task to me but when I look at the bigger picture of things I have more courage and am so anxious to get there. In a nutshell I believe in what I am getting into and I have passion for it not forgetting the number of people benefiting from it. I’m sure readers are currently in awe now of what you’ve just said. How much has your formal education contributed to your amazing personal development? This one is not even to be asked again, it has done a whole lot of help to make me who I am, it has developed my way of thinking and doing things. This is all thanks to my formal education cycle and my seriousness in it too. Sometimes we say education will not necessarily make you successful I don’t agree to that because if not for the formal education you get you will not even have those potentials of becoming who you want to be, because your mindset will always be limited with no diversity. I don’t have much to say on this but please endeavor to go to school and pass through formal education even if it is just for formalities. And don’t be surprised with the results you get because they come as you deserve it and it also depends on the efforts you put in. Well said, Grace. What is your advice to youths when they say there are no jobs? For me I know it is not an easy journey and it will never be an easy journey to take when doing follow-ups after graduation and being in search of a job. But the most difficult one is having that job and not being able to get what you want at the end while you could as well look at all those things you ever loved doing but always told yourself about the impossibilities which don’t have to be. So all I AM TRYING TO SAY IS THERE IS A LOT OF MONEY IN THE AIR WITH THE UNCOUNTABLE OPPORTUNITIES WE SEE FLYING. JUST GRAB YOURS AND MAKE SOMETHING GREAT OUT OF IT BY SOLVING THE PROBLEM OF NO JOBS AND AT THE SAME TIME EARNING A LIVING. ‘BE THE SOLUTION PROVIDER TO THE NO JOB PROBLEM’. What I will always tell young ladies is to be the women they want to see, not following me because every door has its own key and the key to my door will never be yours. Don’t try copying my doings but try to unleash yourself and believe so hard in what you can offer rather than waiting in the back for a successful man to find you. Be the brightest star in the sky and prove the world wrong about women being unable to do great things. I am strongly behind the women empowerment move (HE for SHE) we have to make the men see us in a different way and finally give us the respect we deserve rather than always trying to run behind them for aid while we can have the potentials of being leading women (SHE LEADS AFRICA). Imagine us being able to carry another human being for nine months and more and enduring the pains in the labor room and finally educating that same human being about being a great person. Then why can’t we do same to ourselves with that same energy of leading AFRICA? All I am trying to say is we young ladies should start acting fast by thinking big, being uncommon, innovate or die, be the change you want to see (change makers) and not forgetting to be optimistic/positive. Thank you so much Grace, you are one in a million! Tell me readers, wasn’t this spicy? Share your thoughts in the comment section.